Deputy personnel from Lancaster Sheriff’s Station responded to the parking lot located at the 43100 block of 15th Street West, Lancaster, on Monday, January 8, 2018, at approximately 7:00 a.m. A concerned security officer notified personnel of a disoriented man looking into parked vehicles. The deputies contacted the man and discovered he was Mr. Foster Ellsworth Madison, the 70 year-old man who suffers from Alzheimer’s and had been missing since Sunday, January 7, 2018. As a precautionary measure the deputies called paramedics to check on his well-being, as he was missing for approximately 24 hours. Mr. Madison was deemed in good condition and was transported home by deputies where he was reunited with family. A special thank you to the diligent security officer for his assistance in locating Mr. Madison. 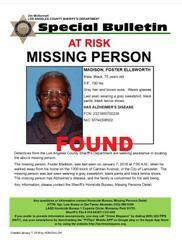 Los Angeles County Sheriff’s Department Missing Persons Detail detectives are seeking the public’s assistance in locating Foster Ellsworth Madison, a 70 year-old, Black male, who was last seen walking away from his home on the 1300 block of Camran Avenue, in the City of Lancaster, on Sunday, January 7, 2018, at 7:00 a.m.
Mr. Madison is described as 5’08”, 190 lbs., with gray hair, brown eyes, and wears glasses. He was last seen wearing a gray sweatshirt, black pants, and black tennis shoes. Mr. Madison suffers from Alzheimer’s disease and his family is very concerned about him.